24 tracks: Hard, Hard Times * Now I’m Easy * Birds of a Feather * A Reason For it All * Nobody’s Moggy Now! * No Man’s Land * Front Row Cowboy * When The Wind Blows * Lock-Keeper * Little Gomez * If Wishes Were Fishes * Leaving Nancy * Wee China Pig * Safe in The Harbour * Do You Know Any Dylan? * And The Band Played Waltzing Matilda * As If He Knows * The Dalai Lama’s Candle * One Small Star * Introduction Song * At Risk * The Law * Refugee * Eric and The Informers. 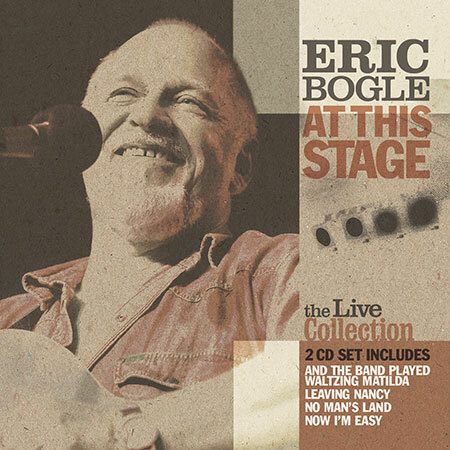 Double CD of live performances, featuring Eric’s most requested songs from the past thirty years, coming from a variety of concerts and studio appearances. This release features Eric’s most popular songs as well as some special rarities, and as always, despite the heavy nature of the subjects, Eric has the uncanny ability to hit you on the head with wit and humour. His songs have been covered by many singers and groups, from Mary Black to Billy Bragg and The Pogues to REM - Tony Blair even chose the Eric Bogle song No Man’s Land as his personal statement as an anthem for peace in Northern Ireland. Eric’s song And The Band Played Waltzing Matilda was in the top dozen songs of the Australasian Performing Right Association’s 75 year celebrations. To emphasise this point, a celebrity Top Fifty Peace Songs Poll held in Scotland placed the same song at No 1, and No Man’s Land at No 5, amongst very stiff competition which included John Lennon, Donovan, Elvis Costello and The Rolling Stones. Enjoy the songs, enjoy the humour and enjoy Eric Bogle as if he was singing in your own front room.